Early coordination, prefabrication, and judicious value engineering contributed to the accelerated completion of this Upstate New York design-build project. The Onondaga Lakeview Amphitheater, near Syracuse, N.Y., seats 17,500. It is the first phase of a more extensive revitalization initiative that will benefit two nearby communities. Photo: David Revette/Revette Studio. Click here to enlarge. In September 2014, New York Governor Andrew Cuomo signed legislation that allowed for the construction of a new performing arts venue on Onondaga Lake, about five miles northwest of Syracuse. 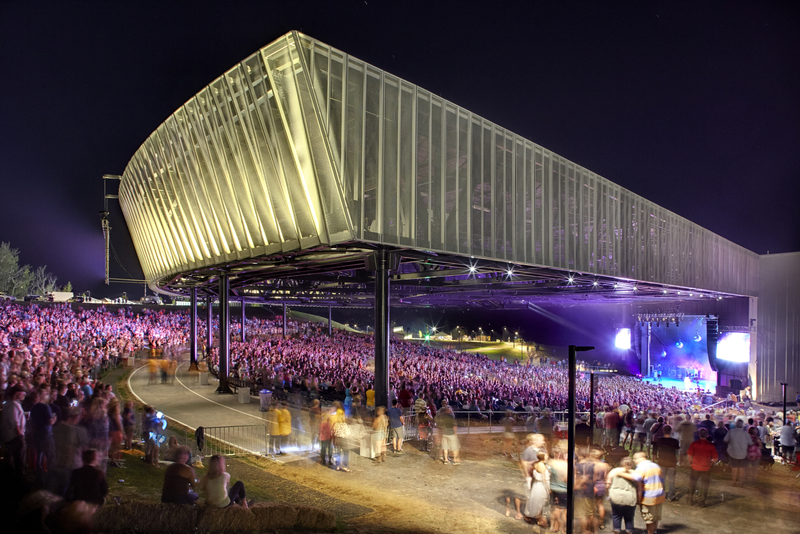 One year later, on September 3, 2015, the Onondaga Lakeview Amphitheater, a gleaming, 74,000-sf outdoor event complex with a seating capacity of 17,500, held its first performance, featuring country singer Miranda Lambert. This summer, the facility will host 25 concerts. + Owner: Onondaga County, N.Y. The state-of-the-art amphitheater transformed an EPA-designated Superfund site into a destination that honors its surroundings and encourages a celebration of arts and culture. The facility was the first step in a larger community revitalization initiative along the lake’s western shore, involving the village of Solvay and the town of Geddes. It’s the only vertical design-build contract that the Empire State has let go forward. With an accelerated construction period, early and constant Building Team collaboration and cooperation were essential for the on-time and on-budget completion of this project. That collaboration began even before the county awarded the contract, with the structural design team working at risk to deliver the steel mill order only eight days after the contract was signed. Project planning and early identification of subcontractors were critical to the success of this project. BIM played a seminal role in delivering accurate documents on time. The integration of structural analysis software (ETABS) and modeling software (Revit Structure) quantitatively reduced the drawing production time, while increasing the accuracy of the information. The performing arts center was designed to blend in with its surroundings. A bicycle path that encircles the nearby lake runs through the facility. The backlit fascia is meant to match the natural light at dusk. Illuminated panels mimic the local landscape. Photo: David Revette/Revette Studio. Click to enlarge. The site consists of capped industrial waste. Any attempt to remove it could have resulted in further environmental damage. To avoid this, the design minimized the need for significant cut and fill. Gilbane Building Company, the general contractor, mandated 40-hour Hazardous Waste Operations and Emergency Response training for anyone who would be working in potential areas of contamination. Gilbane also calibrated on a daily basis air-monitoring workstations that tracked contaminants on site or dissipating outside the work perimeter. Over 80,000 cubic yards of existing industrial waste were excavated and relocated to an onsite staging area. Another 130,000 cubic yards of infill were brought in. More than 230 steel piles were driven to support the amphitheater’s back-of-house and pavilion structures. To deliver power, water, and other services to the facility, Gilbane drilled horizontally underneath Interstate 690 without needing to close down any lanes. The building’s design and orientation take advantage of the natural land contours and lake views. So integrated is the building’s design with its environment that a bicycle path which circles the lake passes directly through the pavilion, underscoring the site’s function as a county park. The covered pavilion’s fascia, when backlit, correlates to the natural light at dusk on the lake waves. The pavilion façade has 198 steel-supported, 20-foot-high mesh panels that, when illuminated, play off the natural landscape beyond the amphitheater’s lawn. The fascia allows the transmission of highly amplified sound from speakers at the stage and from behind the mesh to reach patrons with clarity. The rear lawn loudspeakers—12,500 of the amphitheater’s seating capacity is on an 80,000-sf lawn—are positioned directly behind the unobtrusive open mesh system, which is not only designed for sound integrity but also to provide a clean look at the rear skirt of the shed roof. Westlake Reed Leskosky’s in-house theatrical and A/V specialists conducted thorough reviews of the amphitheater’s audiovisual requirements throughout the design and construction stages. Acoustical consultant Jaffe Holden assisted on the sound parameters of the design. The covered area of the amphitheater is supported by eight trusses (each weighing 84,000 pounds) with four unique end conditions to achieve a maximum span of 190 feet. The covered area is designed to provide patrons with unobstructed views of the lake. Acoustically transparent fascia allows sound from the stage to reach the audience on the lawn with clarity. Photo: David Revette/Revette Studio. Click to enlarge. The amphitheater’s original program was valued at over $80 million, but the taxpayer-funded contract was less than $50 million. Smart engineering and construction were imperative to meet the county’s goals for the building. The signature feature of the amphitheater is the pavilion canopy, which covers more than 5,000 seats and provides unobstructed views of Lake Onondaga. The design called for maintaining bolted connections in the field, which allowed for swift erection to meet the project’s schedule. The pavilion’s roof design utilizes eight trusses with four unique end conditions; this system achieves a maximum span of 190 feet. Each truss weighs over 84,000 pounds and is supported by the steel at the stage and columns infilled with 10,000-psi concrete. Ninety percent of the trusses are identical in their configuration. Gilbane prefabricated the trusses off site. They arrived at the site in no more than three sections and were set in movable cradles for final connection detailing. Completed trusses were erected in one pick, using a pair of cranes in tandem. Systems and spaces were shifted to save money. Relocating the fourth-floor Event Center to a lower level provides panoramic views of the lake and eliminated the need for two elevators. The third-floor mechanical room was moved as well, allowing the pavilion to be reduced in size from four stories to two, which saved considerably on costs. An average of 230 tradespeople were on site every day during construction. The project exceeded 200,000 total worker-hours without a single recordable or lost-time incident.